It is often said that knowing our history is so important that we should make more of an effort to preserve our past. The majority of the Granges in Connecticut are either nearing, or older than, the 100-year mark. Do you know your Grange’s past history? Have you seen photos of past Grange Presidents, or of the construction of your hall? Maybe you’ve heard stories and seen photos of events your Grange has held, such as picnics, agricultural fairs, meetings and more. Where are these historical documents and photos stored, and have your newer members seen these photos and been giving a “history lesson” of the milestones in your Grange’s past? Why is the past so important? Old photos, articles, clippings and documents are messengers from the past. They tell us stories about the Grange and the people who made up the organization. Although these people may have lived a hundred years ago, undoubtedly they had many of the same needs and concerns, hopes and fears, and enthusiasm that we experience in the Grange today. What is your Grange doing today to document the present for future generations? Are you saving newspaper clippings, writing down important milestones and fond memories, collecting mementoes, and thus preserving history? Are YOU taking photos of your Grange events and activities? Digital photography is now more popular than using a traditional film camera, both in the amateur as well as in the professional field. Digital cameras are affordable, convenient, durable, flexible, and the quality is constantly evolving. Digital images are now equal to, and often better than those taken with a film camera. Most smart phones have a digital camera built-in. Stores such as Big Lots and WalMart sell Digital Cameras for as low as $20 or less. Digital photography gives each Grange the ability to not only document their activities, meetings and projects for historical purposes, but explore the art of creativity through photography. • Always carry your camera to every Grange meeting, activity and event - and even when you visit other Granges! • The outside of Grange Halls and meeting places should be one of the items on the top of your photography list. Be sure to capture the location in various seasons, and from different angles. • Explore your creative side through your photos! There’s a lot of things at every Grange meeting you can take artistic photos of: sashes, station scarves and badges, songbooks, the piano, the flag, the implement box, and even the fruit, wheat and flowers of the Graces. Don’t be afraid to try out new perspectives. • Don’t forget to photograph special occasions, such as awards nights and presentations. Be sure to get a photo of the Grange President presenting the plaque or certificate to the honorees. • Activities and events involving food are perfect for taking photos. There’s always the shot of the person holding a plate of food, or the cooks in the kitchen - but don’t forget to photograph the food itself, such as a full table of goodies at a bake sale, a plate of cookies artfully arranged, a beautiful pie or cake, or even a creative shot of a buffet line or the numerous dishes at the potluck supper. Use you imagination when taking photos, but more importantly - just take photos, and lots of them. Then share your photos at your Grange meetings. Make a Grange Scrapbook. Hang photos on a bulletin board in your hall. 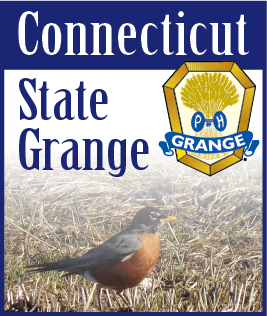 Be sure to send your photos to the CT State Grange website to be added into the Virtual Scrapbook. Preserve your Grange memories for the future.